Welcome to our guide to the Yorkshire Terrier. The DogExperts.info website aims to ask questions to breeders, vets and experienced owners to get the answers to your most frequently asked questions about the Yorkshire Terrier breed of dog. We would love to feature your dog and publish any photos or pictures of your Yorkshire Terrier you would like to email us. 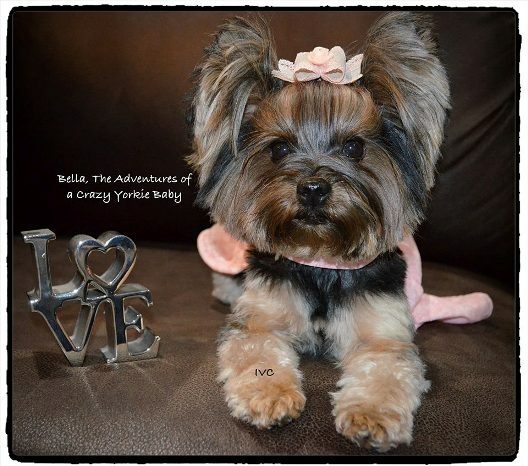 On this page, we feature a unique interview with Bella who was able to respond to our questions with the help of Irene Vela, her owner. Well, I’m a beautiful Yorkshire Terrier. My name is Bella and I live in Long Island, NY. How long have you owned a Yorkshire Terrier? I’m my mommy’s first Yorkie. I’ve been living with my family for 3 years now. February 22nd was my third GOTCHA day…WOOHOO!!! Mommy had an appointment with a breeder in NJ and the day before, daddy told her that they should go look…just look for puppies in stores just to see how they are. She was sad because all the puppies … looked sad and in bad health conditions. They were going home and she remembered that lots of her friends recommended a small puppy store where the owner ADORES the few puppies he has there. Like I said, mommy was not planning on buying a puppy, but buying from a breeder…but we fell in love at first sight. We are in favor of rescuing puppies more than anything or getting them from recognized breeders…now we’ve learned a lot, back then my mommy was kind of new to the fur baby world. Are you serious??? We are just adorable!!!! We are cute and fun. We are small enough to be taken anywhere. We love to get dressed…at least I do. We are loving and will follow you everywhere. We will steal your heart at first sight…and I know that all fur babies have all these characteristics…except the size maybe…but I don’t want to make believe that we are better than other fur babies…God created all of us to love you unconditionally and to be by your side without judging you…we are pure LOVE! And we Yorkies have all those characteristics and a big attitude in a very small body and that make us even cuter. OMG! I am a little DIVA and most of us girls are. We are very cuddly and loving…but sometimes we also need our space…even though we don’t need too much space because of our size, if you know what I mean? We love to play and interact with people. We need to be with someone all the time….but…we can be a LITTLE loud sometimes. Just a little though but it might be because we are protecting you, or because we want to play, or we are hungry, or we are bored. I believe the Yorkshire Terrier is quite a popular dog on social media/Internet these days, can you tell us how this started? I don’t know how it started for the rest of them but I can tell you my story. Mommy says that I’m a blessing to her because she felt really, really lonely when she moved to this country. She left all her family and friends where she lived before. She never thought about having another fur baby because she suffered tremendously when my fur brother and fur sister passed away (I didn’t know them but mommy said that they were two beautiful chow-chows). So after 5 years of them passing away, she felt she needed another fur baby to love and care and that can love her back….and TADA here I came to the picture…her little angel. And all her sadness went away and my home was filled again with love and laughter and she was so, so, so thankful and happy that she wanted to share me, my silliness and my cuteness with more people. So she joined few groups in FB and one of my aunties suggested her to create a page and after thinking it for a while she did! Now I’m so blessed to have lots of friends to share my adventures with and I love them all and they always tell me how much happiness I’ve brought to their lives also. So…mission accomplished…I think that little Bellita might be doing something right. What are your feeding routines, such as how often and what types of food do you feed the Yorkshire Terrier? Mommy is very, VERY careful with my food..as careful as she is when she feeds my family! I eat raw commercial food three times a day…I know…I just love my food. I love basically three brands of food. I don’t know if I can mention them here but if not you can just omit their names. My favorite brands are Primal, Answers raw food and The Honest Kitchen. I also eat vegetables and fruits. I always take supplements because unfortunately and even though my food is made with all natural and organic ingredients, our soil is so depleted after all the things that we’ve done to our planet that it is better for me to supplement my food, just in case. I love all the supplements from Dr. Dobias. They have helped me tremendously. I also get some apple cider vinegar, golden paste and raw goat milk and/or broth in my food and twice a week I get my raw bones…specially duck necks, feet and marrow bones. YUMMY!!!! Oh boy…I did and mommy was sooooooo scared! I was not feeling bad at all but my poopies (OOPS…can I say that) well…my tummy then was not doing so good. This happened about…hmmmm….let me think….over 2 years ago. Well…mommy took me to the regular doctor I used to have before and they sent antibiotics and nothing…she took me to the hospital because she was scared…they sent antibiotics again and nothing. They sent me to a specialist and she said that the home cooked food was “killing me” and that I needed DOG FOOD…as if… She said that I had either IBS or IBD and that she wanted to make some blood tests but that she was not sure if they were going to reflect what I had. My mommy and I were seriously mistreated and screamed at by this specialist so mommy decided to leave and then she started all the process of reading and researching. She found wonderful holistic veterinarians online and fantastic articles so she learned that the only thing I had was an intolerance to chicken…and unfortunately most of us develop that intolerance and we are misdiagnosed and treated incorrectly. The solution was very simple. If I was intolerant to chicken…then I couldn’t eat chicken anymore. Easy, right? I didn’t need antibiotics nor any other drugs. I just needed to eat healthy, organic food and leave all the toxic stuff at a side…because it doesn’t make us good but all the contrary….lots of products and food are making us sick and even killing us 😟 So please parents…be aware of how you are raising and feeding your fur babies. Do your homework like my mommy did! Obviously grooming is another major aspect of owning a Yorkshire Terrier, can you offer any tips, advice and popular accessories for your Yorkshire Terrier? Well….we need a lot of care and our coats also need lots of care. Yorkies are known by their loooooooooong beautiful coats. Mommy prefers a puppy cut for me since I’m always on the go…going everywhere with her, I use only organic products, like shampoos, conditioners, toothpaste….everything organic and made with essential oils. Mommy gives me a bath once a week and she combs my hair at least twice a day. Maybe my topknot and braid needs more care during the day since sometimes I mess it up when I play. I love to wear a bow on my hair and because my topknot is so long…I actually wear a braid…I really need to have a bow on or I can’t see anything. Toothbrushing is a MUST! Every day…not whenever! Specially we, Yorkies, are prone to have dental problems. And it is known that by age 3, most of fur babies have already dental problems but not with special care. I just went to my wonderful holistic vet and she said that my gums and teeth are BEAUTIFUL and healthy. Be careful also with the toothpaste you use because there are some products with xylitol and that can be deadly to us 😟 Always choose organic ingredients and essential oils. Use a real toothbrush…I’ve heard some mommies recommending just a gauze…It doesn’t work! Plaque has to be removed and a gauze is not enough! Raw bones are also fantastic to keep our gums and teeth healthy….always raw…never feed cooked bones please. As you see I’m talking more about teeth than coat and it is because parents usually pay attention to our coats because they can see it but not our teeth. When you take your baby to a groomer, even if it is and old groomer or a new one…please make sure you specify what kind of cut do you want and PLEASE make sure she doesn’t put anything around your furbaby’s neck. We, Yorkies, are prone to collapsed trachea so you don’t want them to hurt us. 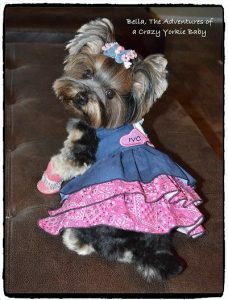 Here is another great interview with Dana Renee, owner of Ruby, a female Yorkie. My name is Dana Renee and I live in London, Ontario, Canada. I have two Yorkshire Terriers named Ruby and Rosie. Ruby has her very own Facebook page that she shares with her sister, called Ruby Red Leggz. I have owned Yorkie’s for approximately 16 years. I first owned a Yorkie-Poo named Bob, and I got him in 2001. My first purebred Yorkie Buster came to live with us in 2008. I have bought all my Yorkie’s from professional breeders. I get to meet the dogs and the parents this way (in most cases) and can see the temperament of the dog before I purchase it. I have always tried to get to pick out the dog myself, instead of a breeder just having one ready for me. I always like to see which one I have the best rapport with. From your experience, what makes this breed so special? Oh, there are so many things that make this breed special, where do I start? First, their size. With a small dog, you can do more things and go more places. For example, if you are visiting family they are more likely to allow you to bring one or two small animals, but might not allow even one large breed such as a Labrador Retriever. Because of their size, they can easily fit into a purse and can go shopping with you as well. If you are flying, they are allowed to fly in the cabin, instead of being relegated to the cargo area (which no dog should ever have to go!). They are called lap-dogs for a reason, they fit perfectly into them! No big dogs stepping all over you in bed to wake you up in the morning. Most apartments, even if they do not want animals, will permit a small dog such as a Yorkie. They do less damage and overall are easier to control than a large breed animal. Second: Their personality… Yorkie’s are full of personality. In my experience, they are easy to train to do tricks and are easy to control for such things like jumping up on people and barking. Now you might laugh on the latter point there, but a dog is only as good as its trainer. Most people think that small dogs are yappy. Well I have got news for you, ANY dog can be yappy. It’s just called barking. A responsible dog owner will take the time to train the dog and make it aware of the things it is allowed and not allowed to do. This makes your pup happy as well, as it lets them know what behaviour is acceptable and what is not… which brings me to my third point. Yorkie’s love to please! They love to make you happy, see you smile and give you some lovin’! They love to perform tricks and will always enjoy a good treat as a reward afterward. This makes them great companions as they do always want to be near you and for a senior or lonely person, this really lifts the spirits. Fourth: They don’t eat as much as a large dog would. This can possibly save you a considerable amount of money. This leads into my fifth point, of being easy to take care of and cleaning up after. No huge piles of ANYTHING to pick up with a Yorkie. Sixth: They don’t need as much exercise as a big dog would. This makes them perfect for people who are unable to get outside and walk their dog every day such as seniors or people with a disability. They are great for people with small homes, or apartments with small backyards. There are many other things that make Yorkie’s so special, but I could go on for days. Hopefully I have touched on the main ones! From my experience and the experience of my friends who own Yorkie’s, they have very good temperaments. (see section above). However, Yorkie’s are known to be quite stubborn. Be sure to be consistent in your training to let them know what behaviour is acceptable and what is not. I believe the Yorkie is quite a popular dog on social media/Internet these days, can you tell us how this started? Yorkie’s have been famous since the time of Smoky, the Yorkie who served in WWII. She was a little 4 lb. Yorkie who, by doing a job that only a tiny little thing could do, saved over 250 men, including saving the life of her owner. You can read Smoky’s full story on just about any Google searches for her. I am not exactly sure how Yorkie’s started to become so popular on social media, but hey, what isn’t? I do know that, I myself, am a part of many Yorkie Facebook groups. In these groups, we share pictures, funny stories and can ask experienced Yorkie owners questions about their Yorkie. I am not sure who the first dog was who started their own Facebook page, but these are becoming popular with cute dogs whose owners can tell funny stories or make interesting commentary. The first dog I started to follow was the incredible Yorkie named Misa Minnie. She is a tiny angel who can do just about anything! I liked several “famous” Yorkies, and then decided to start Ruby’s page while I was six weeks recovering in hospital post-transplant. I had nothing better to do, so I thought, “why not give it a try?!”. What are your feeding routines, such as how often and what types of food do you feed the Yorkie? I feed Ruby and Rosie once a day and leave the food there so they can nibble on it whenever they feel like it throughout the day. This may be abhorrent to some dog owners, and trainers, who feel that there should be specific feeding times. However, I have found in the past that when I put down and take up food, my Yorkie’s refuse to follow my schedule. In general, a Yorkie should eat between 120-200 calories a day depending on whether they are puppy’s or adult dogs. Most Yorkie owners feed a variety of different brands and there is no one TOP brand. However, a lot of people choose Fromm. I myself choose a selection from the Blue Buffalo Company. It is very important to feed any small dog dry kibble over soft food, as small dogs are known for their many dental issues. If you are going to feed your Yorkie wet food, you MUST brush their teeth afterward to avoid serious dental problems in the future. Yorkie’s have very delicate and sensitive stomachs. So, unless you want to be cleaning up doggy messes all the time, it is good to stick to one brand of food (not constantly changing brand, or from puppy to adult back to puppy). Feeding them human food can also cause a plethora of health problems, and will contribute again to the dental wellness of your dog. Yorkie’s can encounter many health issues as being a smaller dog puts them at risk for serious injury. I have never encountered any health issues with my Yorkie’s other than collapsed trachea and dental issues. All small dogs, especially a Yorkie, should be walked with a harness instead of with a collar. Their tracheas are too delicate and a collar can pull on and collapse their trachea. This causes breathing problems and can even cause death. Obviously grooming is another major aspect of owning a Yorkie, can you offer any tips, advice and popular accessories for your Yorkie? There are two types of Yorkie owners. The type that prefer the longer, show style hair and those who prefer the shorter (and easier to manage) puppy cut. I choose the latter. I find it easier to keep their hair in a shorter cut, but I always try to leave the hair on the top of their head, and face a little longer. This allows for you to put accessories in your Yorkie’s hair, if you so choose. Every Yorkie is different and will have differences in their coat. Some have silky coats and some have fluffy cotton coats. Most Yorkie’s have full, thick hair, but some Red Legged Yorkie’s (such as my Ruby Red Leggz) will have very silky, but thin coats. Due to both Ruby and Rosie having thinner coats, both of my girls prefer to wear clothes during the winter months. 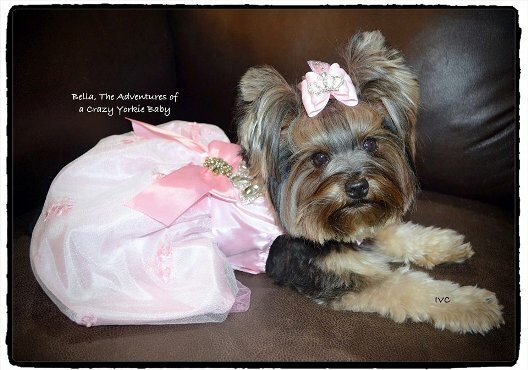 Many Yorkie owners have closets full of clothes for their little ones, while others prefer them to be au naturel! As I stated above, during the winter Ruby and Rosie come a runnin’ when I show them their sweater or coat. It keeps them warmer, and that keeps me happier knowing they are comfortable. I would LOVE to put bows and ribbons on either Ruby or Rosie, but Rosie will not stand for it. Ruby used to wear bows, until Rosie came along and ripped them off her head. Rosie would not allow bows in her hair at all, and within 20 seconds would have her head in the couch maneuvering her head as to escape the “nasty trick of a bow”! When it comes to dogs: doggie see- doggie do. After seeing Rosie’s dislike of bows, Ruby now treats them the same way. I know many Yorkie owners who give their little ones a bath every week. I think that this is an individual preference. Since most Yorkie’s do not require much exercise, simply running around the backyard is about as messy as they can get. However, some owners do not like the fact of bathing that often because it can severely dry out your Yorkie’s coat. To prevent a dry coat, you can feed your dog a teaspoon of Coconut oil a day. I choose to never bathe Ruby or Rosie more than twice a month. Usually every other week. However, when I owned my Yorkie-Poo Bob, as a senior he required more frequent bathing’s as his hair became greasy and would start to smell within a couple of days. Therefore, I started giving him baths pretty much every week or 9 days. Be patient with your new puppy, they do not yet know what you expect from them. Most people get their Yorkie as a puppy, and you must remember that they have just left the safety of their mother, brothers and sisters to come to a new place where everything is foreign to them. Take the time to train them properly and do not always punish them for accidents they make. Be regular and consistent in your training and give a stern, but not abusive, response to any negative behaviour that is displayed. Reward them greatly with either treats, praise or both! Yorkie’s love to be praised, and just like humans, will always perform better in a positive environment over a negative one. Give your dog a routine, this will make both of your lives easier. And lastly, do some research before you purchase a new Yorkie. There is a plethora of information out there on the internet or in printed form. Take the time to learn about your Yorkie and know what is best for them in all aspects of their life; training, diet, health, exercise, etc. Determine whether you have enough time, and physical capability for the size and breed of dog you are looking to add to your family. Remember, you are adding an additional family member, see them as that, and treat them as you would one of your own children. I find this approach will give you the most gratifying results. Why Choose a Yorkshire Terrier? What type of owners buy a Yorkshire Terrier? What in your opinion are the best things about the Yorkshire Terrier breed? Why do you think the Yorkshire Terrier is special? What are your favourite things about the Yorkshire Terrier? Are you glad you choose to buy a Yorkshire Terrier and not another breed? 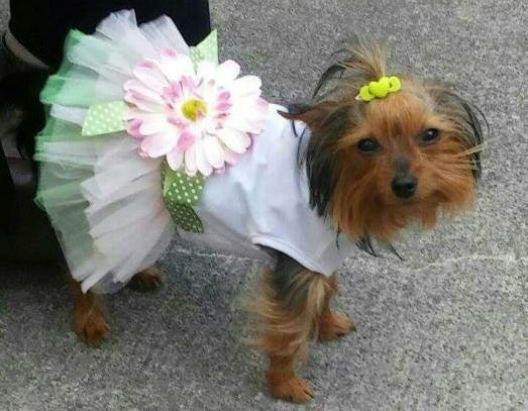 How would you describe the Yorkshire Terrier temperament? What advice might you give to people thinking about whether they should buy a Yorkshire Terrier over other breeds? What are the history and origins of the Yorkshire Terrier? What colors of Yorkshire Terrier are most popular? What does the Yorkshire Terrier look like? What are the pros/cons of the Yorkshire Terrier breed? What can a new owner expect in terms of differences between the Yorkshire Terrier and other breeds? What type of typical personality does the Yorkshire Terrier have? Is it possible to describe a fairly typical Yorkshire Terrier? What is the breed standard/description for the Yorkshire Terrier? Are there any downsides to owning a Yorkshire Terrier that prospective owners should be aware of? Is the Yorkshire Terrier breed of dog suitable for first-time dog owners? Some breeds can be described as greedy and prone to weight issues, would this apply to the Yorkshire Terrier? Is the Yorkshire Terrier breed suitable for a person or family that are out at work all day? Some owners seek a breed suitable for barking and offering a guard dog role – how does the Yorkshire Terrier match up to that role? Are there myths about the Yorkshire Terrier – in other words do new potential owners come to you with misconceptions about this breed? What types of questions do you get once owners get their Yorkshire Terrier home? What is the typical temperament of a Yorkshire Terrier, so people know what to expect from their new pet? When fully grown how much on average does a Yorkshire Terrier weigh? When the Yorkshire Terrier is full grown in size what is the maximum height and length expected to be? Is the Yorkshire Terrier ever crossed or mixed with other breeds of dog? Does the Yorkshire Terrier smell or drool a lot? Do you have a Yorkshire Terrier growth chart? What breed group does the Yorkshire Terrier come under? Are there some types of people that you can suggest the Yorkshire Terrier is not suitable for, perhaps families? How is the Yorkshire Terrier with children? Do you think the Yorkshire Terrier is suitable for families with young children? How does the Yorkshire Terrier get along with other (existing) pets and do you have any tips or advice for new Yorkshire Terrier owners in terms of successful integration? Is it better to buy one Yorkshire Terrier or two? Would the Yorkshire Terrier be suitable as a guard dog? Can I leave my Yorkshire Terrier during the day while I go to work? What is the expected average lifespan of the Yorkshire Terrier? In terms of life expectancy, how long on average would the Yorkshire Terrier breed live to? 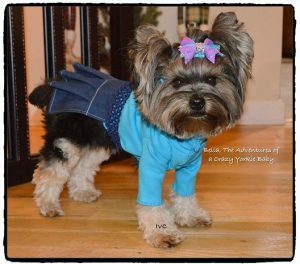 How to handle the Yorkshire Terrier puppy to start off – how much food, what type, how often? Do owners need to consider supplements for their Yorkshire Terrier? How much did your Yorkshire Terrier cost to buy? Can you offer advice to people looking to buy a Yorkshire Terrier and how much should they spend? What advice would you offer new Yorkshire Terrier owners? What types of people are buying the Yorkshire Terrier and why? 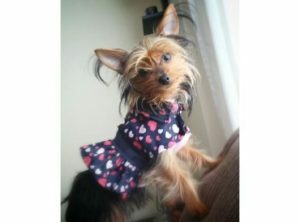 Where can I buy Yorkshire Terrier rescue dogs or find a Yorkshire Terrier for adoption? Please note that buying or searching for a ‘cheap’ Yorkshire Terrier can be false economy as they may have health issues that cost you far more in the long-term – always buy from a good and responsible breeder! How would you describe the Yorkshire Terrier puppy to potential new owners? What types of owners are best suited to owning a Yorkshire Terrier? What inspired you to become a breeder and did you start with the Yorkshire Terrier? As a Yorkshire Terrier breed expert, are there any ‘essential’ tips you would like to share with new owners? How long does it take to housetrain/potty train a Yorkshire Terrier? We invite you to email us your Yorkshire Terrier’s pictures, in particular we are looking for photos showing Yorkshire Terrier puppies at 1, 2, 3, 4, 5, 6, 7, 8, 9, 10, 11 and 12 weeks old as well as early pictures such as 1, 2, 3, 4, 5, 6, 7, 8, 9, 10 and 11 months old to a year old. Do they have any nicknames or does the Yorkshire Terrier have popular names? If my Yorkshire Terrier is pregnant what might the litter size be? Could the Yorkshire Terrier be dangerous around young children? How do you prevent a Yorkshire Terrier biting? How do you prevent a Yorkshire Terrier chewing? How do you stop a Yorkshire Terrier jumping up? Does the Yorkshire Terrier have an issue with excessive digging? Why does my Yorkshire Terrier keep growling and barking? Is there a reason my Yorkshire Terrier dog is often scratching excessively? In comparison perhaps to other breeds what can you say about the Yorkshire Terrier and their exercise needs and do you have any tips or advice for new Yorkshire Terrier owners? As a breeder of the Yorkshire Terrier , do you prefer a collar or harness? As an expert of the Yorkshire Terrier breed do you prefer a standard leash or retractable? Can you offer any dog walking tips for Yorkshire Terrier owners? What games and toys can you recommend for the Yorkshire Terrier? How intelligent is the Yorkshire Terrier compared to other dog breeds? Do you have any special grooming routines or tips and advice for new Yorkshire Terrier owners? What accessories are required to be purchased for grooming a Yorkshire Terrier? How much do Yorkshire Terrier shed and how do I maintain their hair and how often? Is the Yorkshire Terrier a hypoallergenic breed? Any advice/tips you can give concerning cleaning and bathing your Yorkshire Terrier? Can you offer new Yorkshire Terrier owners advice concerning fleas and maybe products you use in treatment and prevention? What advice and tips could you offer to owners who might wish to follow your path in showing the Yorkshire Terrier? What started your interest in showing the Yorkshire Terrier? If a new owner perhaps wanted to meet other owners or find out more – perhaps they have an interest in joining a local club or maybe they wonder how they can start showing their Yorkshire Terrier – where would they begin? How would an owner know they have a show-quality Yorkshire Terrier and how would they start off? What official organisations are there for the new Yorkshire Terrier owner and what benefits or services do they provide? In buying a Yorkshire Terrier, can you offer advice and tips to new owners? How did you progress to becoming a breeder and why focus on breeding the Yorkshire Terrier out of all the breeds you could have chosen? What do you think makes the Yorkshire Terrier special to you? In comparison perhaps to other breeds what is it like to train a Yorkshire Terrier and do you have any tips or advice for new Yorkshire Terrier owners? How should new owners approach bringing a new Yorkshire Terrier home, any advice and tips you can give? Should I allow my Yorkshire Terrier to sleep in my bed or elsewhere in the house? 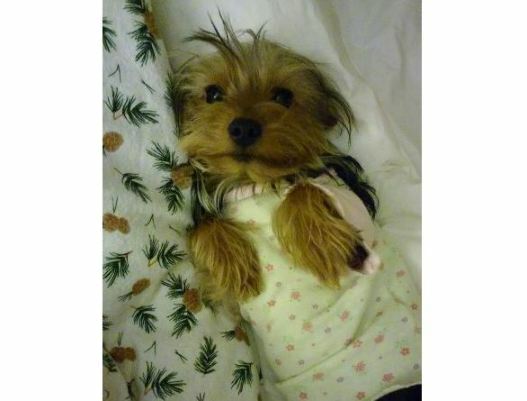 Should my Yorkshire Terrier sleep in a kennel or crate? Health is always a major concern when buying a dog, do you have any advice for new Yorkshire Terrier owners to be aware of in particular? What is the recommended schedule for vaccinations for your Yorkshire Terrier? What type of health issues can a Yorkshire Terrier have and how do you deal with preventing these? Why does my Yorkshire Terrier have diarrhea? Why is my Yorkshire Terrier vomiting and do I go to the vets? When should I take my Yorkshire Terrier for vaccinations and which ones do they need and how often? How often will my Yorkshire Terrier be in heat? 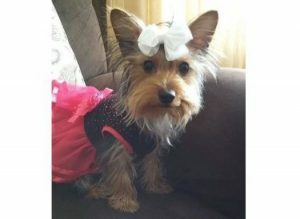 Should I consider getting my Yorkshire Terrier spayed or neutered and when and how much does this cost and what are the benefits? My Yorkshire Terrier is limping, what should I do and should I go to a veterinarian surgeon? Why is my Yorkshire Terrier not eating? How much does it cost to insure my Yorkshire Terrier? What healthcare issues or diseases might be excluded from companies that provide Yorkshire Terrier dog health insurance? What age would you class as an ‘older or senior’ Yorkshire Terrier? What changes in food and diet would you suggest making for an older Yorkshire Terrier? Do you feed any supplements to an older Yorkshire Terrier – or anything else which helps them as they age? Are there any health issues particular to a senior Yorkshire Terrier dog? Do you have any advice for owners of an older/senior Yorkshire Terrier or tips you can pass on? Here’s an interesting video on the Yorkshire Terrier.